Posted on February 20, 2009 at 1:51 pm. It’s always feels great to have your work noticed. 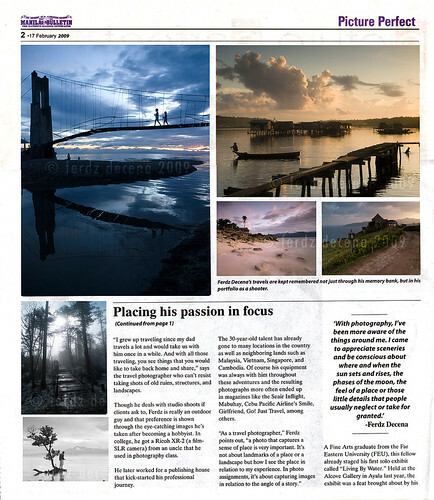 I honestly never imagined to be a feature on Picture Perfect so it was a pleasant surprise when I heard from Ronald Jayme if I could be one of their Photographer of the Week feature. I was still in Laos when the issue came out so I only got to see it a few days after it was out. Though I think the layout could be a little better ( I thought the photos were a bit cramped) and Newsprint really isn’t an ideal medium to print your photos, I really really appreciate the mileage and exposure Manila Bulletin’s Picture Perfect has given. Even considering me as a feature was honor enough. So my sincerest thanks to Ronald Jayme for the feature and to Yugel Losorata for the write up. Below is the write up and you can click on the images for the higher resolution. There goes that opening line from The Beatles’ classic “In My Life.” For lensman Ferdz Decena, this means putting out his camera and capturing images for posterity. His travels are kept remembered not just through his memory bank, but in his portfolio as a shooter. “I grew up traveling since my dad travels a lot and would take us with him once in a while. And with all those traveling, you see things that you would like to take back home and share,” says the travel photographer who can’t resist taking shots of old ruins, structures, and landscapes. 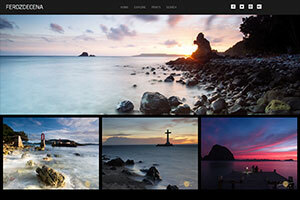 Though he deals with studio shoots if clients ask to, Ferdz is really an outdoor guy and that preference is shown through the eye-catching images he’s taken after becoming a hobbyist. In college, he got a Ricoh XR-2 (a film-SLR camera) from an uncle that he used in photography class. He later worked for a publishing house that kick-started his professional journey. The 30-year-old talent has already gone to many locations in the country as well as neighboring lands such as Malaysia, Vietnam, Singapore, and Cambodia. Of course his equipment was always with him throughout these adventures and the resulting photographs more often ended up in magazines like the Seair Inflight, Mabuhay, Cebu Pacific Airline’s Smile, Girlfriend, Go! Just Travel, among others. A Fine Arts graduate from the Far Eastern University (FEU), this fellow already staged his first solo exhibit called “Living By Water.” Held at the Alcove Gallery in Ayala last year, the exhibit was a feat brought about by his let-me-try act to submit a proposal and a set of photos which he didn’t expect to be approved. Sometimes, true talents find it hard to believe the truth that they’re good. 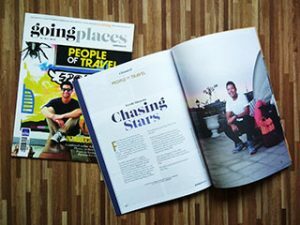 The previous year proved to be a big one for Ferdz as he also won the top prize for “The World Around Us” category of TNT Magazine Travel Writing and Photography Awards in London. 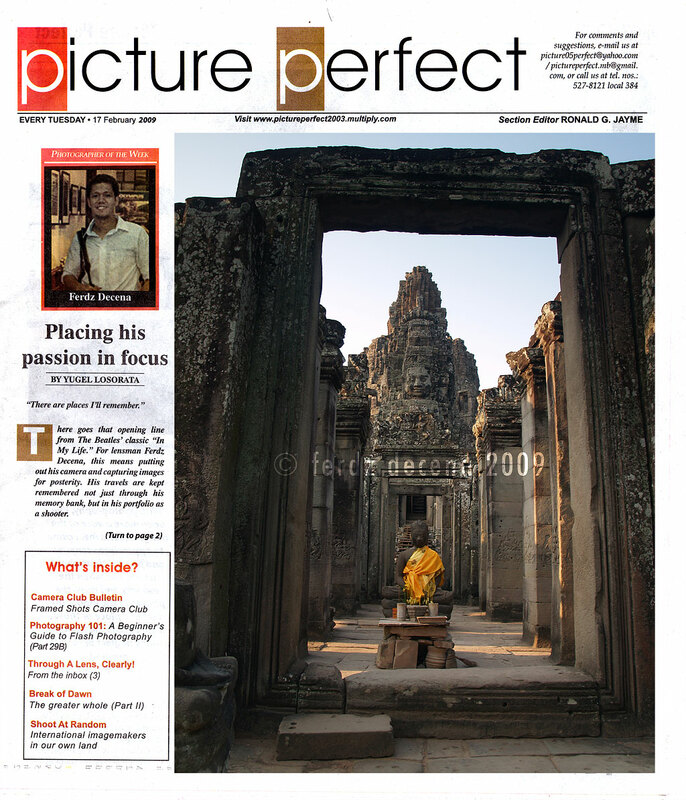 The same shot also took the “Reader’s Choice Award,” beating more than 1,500 international entries. A modern man who loves music and reading, this artist is a widely acknowledged blogger versatile enough to support his pictures with equally good written account of his travels. In 2005, his blog www.ironwulf.net earned the “Best Photoblog” from the Philippine Blog Awards. Two years later, he was a finalist for Best Design and Best Travel Blog. Apart from being an exceptional blogger, he also showed excellence in graphic arts by passing the “Fundamental Computer Graphics Creator’s Examination” by Computer Graphics Arts Society of Japan. That was in 2002 when he was one of only 22 successful passers out of 500 examinees. The man’s exposure to photography dates back to his younger days with tons of photo albums at home and toy cameras to play with. He’s a believer of natural mood and beauty revealing themselves via photos and not by way of too much post-processing. His work says that so. Congratulations for being recognized as a very accomplished photographer. I really enjoy reading this blog and looking at your photographs. Will be back soon. Keep up the good work. wow. good write up. gives justice to the great traveler. feelings and enjoyment lang pala kelangan iventure para makakuha ng nangungusap na larawan. pag aaralan ko yan… gusto kong maging ferds decena balang araw. Welcome back! Can’t wait to read full account of your recent trip. I gather that you enjoy reading. Hope you could write a book/travel guide featuring your stories and photographs, something similar to Frank Wisner’s “Honeymoon with my brother”. Have you read that one? Wow, another feature of your photos! Astig! The photos chosen were a nice set, really. Sunod sunod na yan. Congratulations. You truly are a talented photographer. If you’ve been to Bohol, then, you’ve seen a Tarsier na. Tarsiers are prosimian primates of the genus Tarsius, a monotypic genus in the family Tarsiidae, which is itself the lone extant family within the infraorder Tarsiiformes. Although the group was once more widespread, all the species living today are found in the islands of Southeast Asia. They are banning the display na daw? For me, ok lang since malapit na sila ma-extinct. What do you think? Thanks Kegler! It’s great to know you enjoy the blog. Haha! Thanks JP! Enjoyment naman talaga ang key. Maraming Salamat din sa tulong Barok! Thanks Jaki! 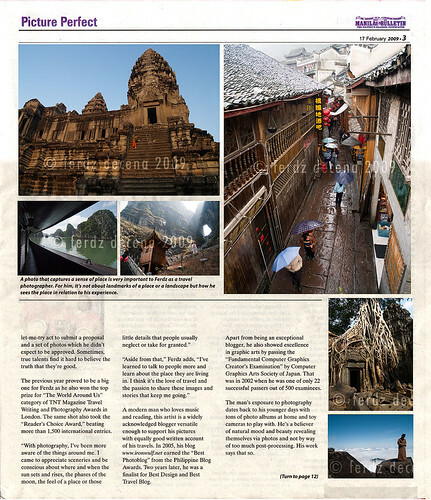 That is still one of my goals, to write my own photo/travel book. But I feel my materials isn’t enough yet. That seems to be a very interesting book. I’ll try to see if we got copies here. Thanks Kyels! I had a quick visit in Malaysia by the way! Thanks Photo Cache! I do hope so it would continue on. Hi Jesse James. Your post is out of topic but I’ll let is pass because of that really cute Tarsier animation :P. Anyways, It’s okay to continue with the display as long as the handling is done well. I remember seeing these poor creatures being mis-handled when I was in Bohol. Wow Congratz sir! being published in a paper is really a big accomplishment. di pa ko nagbloblog im a frequent visitor na of this site if I need to research on my travels and I can na malayo n tlga narating mo sir! Maraming salamat Insider and Angelo. Hey congratulations Ferdz! All these accolades are very well deserved. You truly are a talented artist. Thanks a lot we need lang talaga to protect this creature. Dami na kasing endangered at napapbayaaan na ng gobyerno. Please help me promote this.